These are open opportunities for students at Northeastern University. There may be other ways to get involved with the research group, but any project listed here is one for which we are definitely looking for help right now. We are also recruiting new PhD students for the fall of 2019. Please apply by Dec 15, 2018! You can work with our group either as a PhD in Computer Science student, or as a PhD in Personal Health Informatics student. Students interested in getting involved should send the following information to Prof. Intille: (1) what project, or type of project, you want to work on, (2) resume, (3) grades of all classes at Northeastern, (4) classes being taken in the current semester (or other commitments), (5) classes being taken in the upcoming semester (or other commitments), (6) hours that could be devoted to a research project, and (7) motivation for getting involved in research. There may be additional instructions for some projects in the descriptions below (e.g., a project-specific survey to fill out). We are seeking a part-time student programmer and research assistant to work on an NIH-funded research project exploring how mobile games can be used to advance behavioral science. 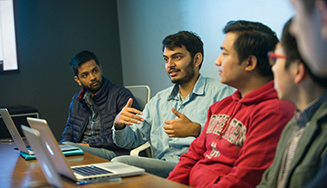 The student will gain experience in mobile and game programming as he or she works with an interdisciplinary research team. The goal of the research project is to design, develop, and test new software and strategies that use the “crowd” to help scientists annotate wearable sensor data collected from mobile phones and body-worn wireless sensors. The team is working on developing new mobile games that are fun to play, but that also serve a secondary purpose of improving the quality of data available to data scientists using wearable sensor data for accurate measure of everyday behavior, such as physical activity and sedentary behavior. We are seeking a part-time student programmer and research assistant to work on an NIH-funded research project focused on processing the influential NHANES accelerometer dataset (18,000+ people) using machine learning algorithms. Eligible students must have solid experience either in (1) AWS cloud computing, or (2) signal processing and pattern recognition algorithms, especially applied to accelerometer data. ​Interested? Please fill out this survey: https://goo.gl/forms/SGeMPNwCd1Ek8RLo2. We are building a biking simulator to be used to conduct a variety of experiments on active transportation. We have all the parts we need, including a bike, sensors, and large displays. We need help instrumenting the bike (steering, brakes, shifters), setting up the system (including fans), doing video processing, and creating VR software using Unity to simulate biking in various environments. If you like hacking sensors, graphics, video, or bike physics, there is plenty for you to do! If you are interested in this project, fill out this survey: https://goo.gl/forms/yWQUj8xkfRRcCOhk1. As part of a project on a new technology to support active transportation via bicycle (i.e., getting exercise by biking to/from work), we want to learn more about current and potential active transportation cyclists. If you are interested in this project, read a bit more, and then fill out this survey: https://goo.gl/forms/yWQUj8xkfRRcCOhk1. Have you always wanted to wear sensors all over your body and become a human cyborg? We need students willing to help us collect data on behavior, to be used for activity recognition algorithm testing. You will wear multiple motion sensors, a smartwatch, a heart rate sensor, a wearable camera, and other sensors as you also provide self-report data on an Android mobile phone. You will help us understand and possibly process your data. No programming experience required, just an interest in technology and willingness to nerd out. We want to create "object usage" sensors for homes, using Arduino or Amazon Dash buttons or some other inexpensive off-the-shelf hardware we can hack. If you like playing around with wireless electronics, help us figure out a good option so that we can wire up a home with several hundred sensors. The data we gather would be used for activity recognition experiments. Help us collect data from participants in scientific experiments where we measure behavior in the Exercise Science lab and around campus. You will help recruit people to volunteer in the research study, wire them up with sensors, observe them as they complete a research protocol (doing a variety of physical behaviors), and then check and clean the data collected so it can be used in experiments. No programming experience required.